What is life without some pickle? Definitely it will be monotonic. 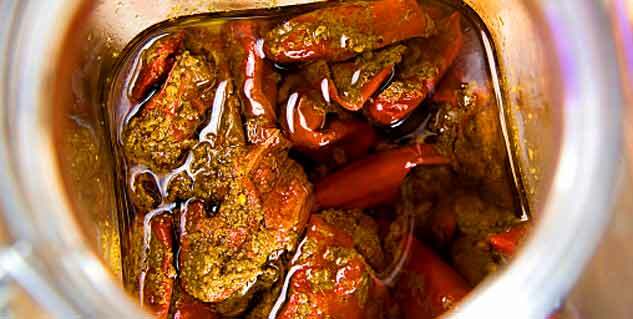 Now, when it comes to pickles, the Benarsi pickle of red peppers steals the show with its sour and savory whack. Wash red peppers and slit the peppers, thus making an opening to stuff them with filling. Mix together, everything, except the oil and the red peppers. Mix all the ingredients together, except the oil and the slip red peppers. Now, add oil to the mixture. Now, you have to stuff the mixture into the red peppers. Press the filling, so that the peppers are stuffed. After stuffing all the peppers, start dipping them into the oil one by one. Finally put them in a container. Pour the remainder oil over to cover the red peppers. Keep it under the sun for about a week. Now, add the remaining oil to the marinated peppers. Keep the container in the sun for more than week. Read more articles on Healthy Recipes.